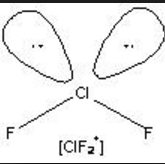 Draw the shape of the #ClF_2^+# ion, including any lone pairs, and name the shape made by the atoms? Predict the bond angle in the ion? The molecular shape is "bent", with a theoretical bond angle of 109.5°. We put the least electronegative atom in the centre. We have #"7 + 2×7 -1 =20"# electrons to fit around the atoms so that every atom gets an octet. The central atom has two lone pairs and two bonding pairs (four electron domains). According to VSEPR theory, this predicts a tetrahedral electron geometry. The molecular geometry includes only the bonding pairs, so the molecular shape is bent, with a theoretical bond angle of 109.5°.